Porters Creek Trail allows you to explore both the natural and historical features of the Smoky Mountains. During the spring, you can see an abundance of wildflowers along this 4 mile hike. It is one of the best trails to see wild geranium, yellow trilliums, and dwarf ginseng. Not only will you experience gorgeous views and historic sites, but you’ll even get to see a waterfall! Fern Branch Falls sits about 2 miles from the trailhead. The 60-foot waterfall drops off the ridge on the left side of the trail. Although Gregory Ridge Trail is a more challenging hike, it’s worth every step! It’s a total of 11 miles roundtrip and is located near the Cades Cove area of the park. The unforgettable views of the flame azaleas you’ll have on this hike are something you definitely don’t want to miss. The flame azaleas can best be seen when they reach their peak late in the spring season. The flowers aren’t the only beautiful sights you’ll have along this hike. Once you reach Gregory Bald, you’ll be able to see Cades Cove, Rich Mountain, Nantahala National Forest, and the Yellow Creek Mountains. Little River Trail is another one of the best spring hikes in the Smoky Mountains. This 4.9 mile round-trip hike features views of a peaceful stream, some history, and wildflowers. The most common flowers found along the trail are rhododendrons, yellow trillium, Canadian violets, and hepaticas. The best time to see the wildflowers are mid-March through April. Rich Mountain Loop offers great hiking opportunities all throughout the year, but there’s something special about hiking it during the spring. The trail is 8.5 miles round trip and reaches a max elevation of 3,691 feet. It’s a great spot to take in views of Cades Cove and includes a variety of wildflowers. If you want to explore Cades Cove while avoiding the crowds, this is the perfect trail for you. 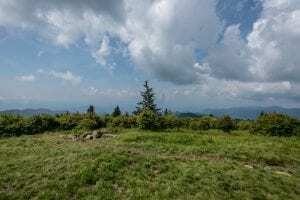 To get to Andrews Bald, you’ll hike the Forney Ridge Trail. About 1.7 miles into the trail, you’ll reach the outskirts of Andrews Bald. About 100 yards from there, you’ll have panoramic views of Fontana Lake and the Smoky Mountains. Like Gregory Bald, the trail features stunning displays of flame azaleas and rhododendron during the late spring. 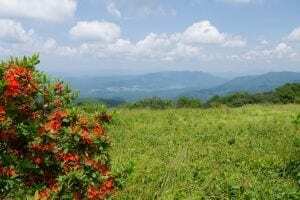 The hike to Andrews Bald and back is 3.6 miles. These hikes in the Smoky Mountains are one of the best ways to explore the area in the spring. For more gorgeous spring sights, enjoy one of our zipline tours! We are surrounded on 3 sides by the Great Smoky Mountains National Park, so it’s no surprise you’ll have breathtaking sights along your zipline adventure. Learn more about our Smoky Mountain zipline tours and start planning your spring trip to enjoy all these fun outdoor activities!